Model DS3 has the ability to DIAL OUT to your mobile phone (or any other programmed telephone number) when you are not home and connect you to your visitor at the door phone (normal call charges apply). You will then be able to converse with your visitor and even let them in if you wish. Model DS3 also provides two internal relays which can be used to open locks in two separate areas (eg; one at your front gate and one at your front door). The second relay in both these models can alternatively be used to SWITCH ON a light, a video camera/recorder or any other electrical device as soon as the call button is pressed on the door phone and then SWITCH THEM OFF after the call is complete.If you have a SECURITY ALARM or HOME AUTOMATION system, you can use the second relay of model DS3 to interface to it and with suitable equipment you can even have a photo or streaming video of your visitors sent to your smart phone. 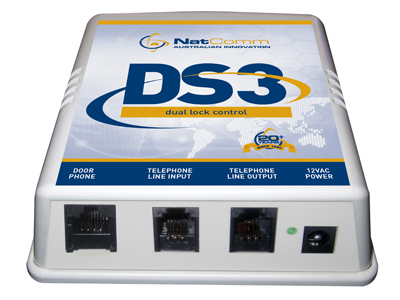 Model DS3 when connected to a Telephone LIne can also be used with Dial Out Cloud Based applications such as NATCOMM IP CONNECT (coming soon) to simultaneously connect your Intercom calls to Multiple Phones, PC's, iPads, Tablets etc. You can then ANSWER the Intercom Call on ANY device and communicate as a Free phone call. If you have an Electric Door or Gate, you can even let your visitors in remotely by pressing ** (for Gate or Door 1) or *2 (for Gate or Door 2), just as you can do from your internal standard telephones. You can use ANY of our DP1 to DP5 model Door Phones with our Model DS3 Door Station Controller. 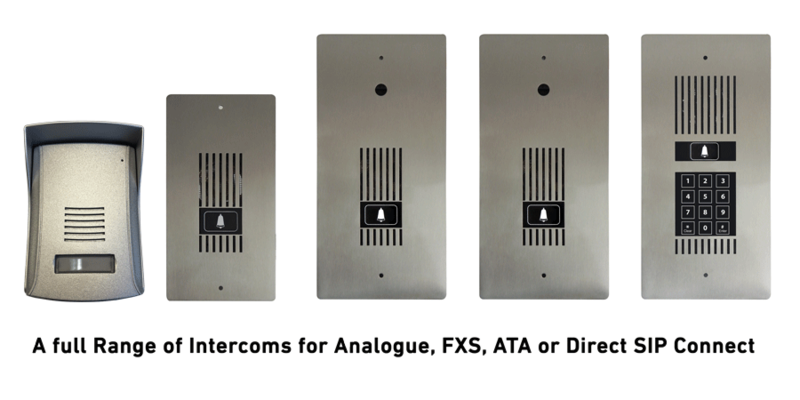 Click Here to view and order a Door Phone Intercom for use with your Door Station Controller. Model DS3 is our Door Station Controller WITH DIAL OUT and DUAL DTMF Lock Control. Controller for ANY NATCOMM Intercom.